Aloba Arch – Chad, Ennedi. One of the most impressive natural arches of the world. Arch is 77 m wide and some 120 m tall. 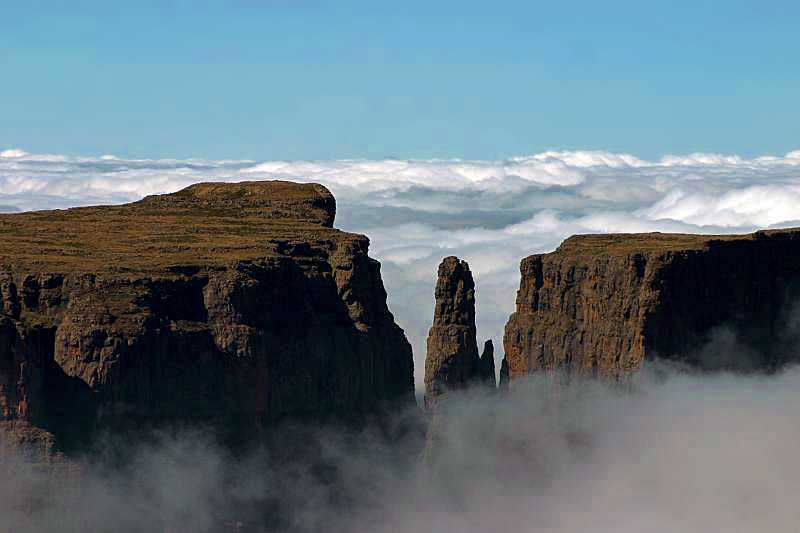 Amphitheatre in Drakensberg in KwaZulu Natal, South Africa is one of the most impressive cliff faces on Earth. This enormous cliff is over 5 kilometers long and 1,220 meters high along its entire length, the highest part of the cliff is 1,830 metres high. 948 metres high Tugela Falls fall over Amphitheatre. Ben Amera (Ben Amira) – Mauritania, Adrar. One of the largest monolithic masses of rock in the world, 400 m high, dark grey pyramid rising from the desert sands. Prehistoric rock art is found nearby. Djoula Oued Arch – Chad, Ennedi. Very delicate, seemingly impossible natural arch. 14 m wide and 32.6 m tall. Fish River Canyon – Namibia, Karas. Second largest canyon in the world after the Grand Canyon (United States). This giant canyon is some 160 km long, up to 27 km wide, up to 550 m deep. Great Tsingy de Bemaraha – Madagascar, Menabe. Unique karst landscape, consisting of thousands of rock blocks dissected by 80 – 120 m deep grikes with vertical walls. Mostly formed by collapse of caves and caverns. Sometimes these grikes are very narrow, less than 1 m and create immense impression to the one walking through them. Countless interesting karst formations, including caves, natural bridges, tufa pseudoroofs. Numerous endemic species of plants and animals – 47% of locally met species of plants and animals are found only in Tsingy de Bemaraha – for example here are 34 endemic species of reptiles. Manambolo River Gorge – Madagascar, Menabe. Spectacular gorge – both banks of the river are formed by giant, steep and often overhanging clifs of Bemaraha Tsingy. Numerous caves, natural bridges and other interesting karst formations. Pico Cão Grande – São Tomé and Príncipe. 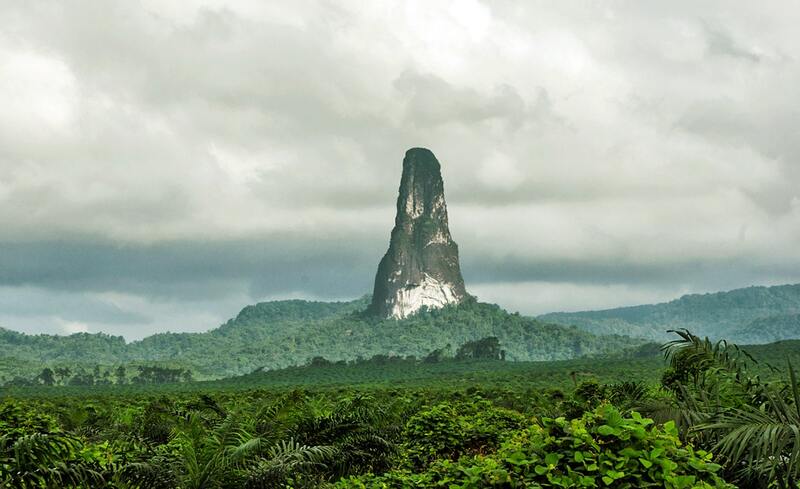 Dramatic needle-shaped volcanic plug which rises more than 300 m above its surroundings. Richat Structure – Mauritania, Adrar. Amazing geological formation – heavily eroded, approximately 40 km wide dome, which looks like a giant eye from the space. Although widely believed to be an impact crater, this is enormous, circular upheaval dome. Takouba Arch – Algeria, Illizi. Weird, impressive natural arch, some 20 m high and 10 m wide. Trou de Fer canyon and waterfalls – several cascades of streams in Trou de Fer – one of most magnificent slot canyons in the world. Total height of Bras de Caverne Falls is 725 m, first step is 210 m high (mostly dry), next – 180 m high and third – 300 m, several smaller steps in between. There are six more very tall waterfalls in the canyon. Lower Bras Mazerin fall is 270 m tall. Tsingy de Ankarana – Madagascar, Diana. Spectacular tsingy – a karst formation, where a layer of middle Jurassic limestone is dissolved by water, leaving a "forest" of limestone blades. Separate blades might be up to 20 m high. The gorges and canyons dissecting the Ankarana are up to 140 m deep. In many larger gorges and canyons exist patches of primeval tropical forest with numerous endemic species of plants and animals. Some of these forests are available only through caves – total length of explored caves in the region exceeds 100 km. Up to 6 m long Nile crocodiles live in the caves of Ankarana (mostly in River Styx – 4 km long subterranean passage passable only by a boat). This is one of the few places where crocodiles live in Madagascar (it is seen also in Belomotse Forest and some other places) and a unique case where crocodiles live in caves. Numerous fossils of the extinct Madagascaran fauna are found here. Zuma Rock – Nigeria. Giant monolith which rises 725 m above the surroundings. Bala’a sinkhole and waterfall (Baatar) – North. Approximately 255 m deep, nearly vertical cave with waterfall in it. Entrance in the cave is some 70 m deep sinkhole. Here waterfall has percolated one side of sinkhole, creating three natural bridges one above the other. Waterfall disappears underground. Chocolate Hills – Philippines, Bohol. Unique geomorphological phenomenon – 1,200 – 1,700 similar grass covered conical hills which form unique landscape. Height of each hill – 40 – 120 m. During the dry periods hills turn brown. Formed from coral limestone which has been uplifted and eroded. Hills contain numerous caves. Göreme fairy chimneys – Turkey, Nevşehir. Thousands of amazing, 8 – 22 m tall rock spires, formed from soft volcanic rock – ignimbrite, overlaid with boulders of harder lava. In these rock spires often are made premises – houses, household rooms, churches and even whole cities. Guilin – Lijiang Karst – China, Guangxi. 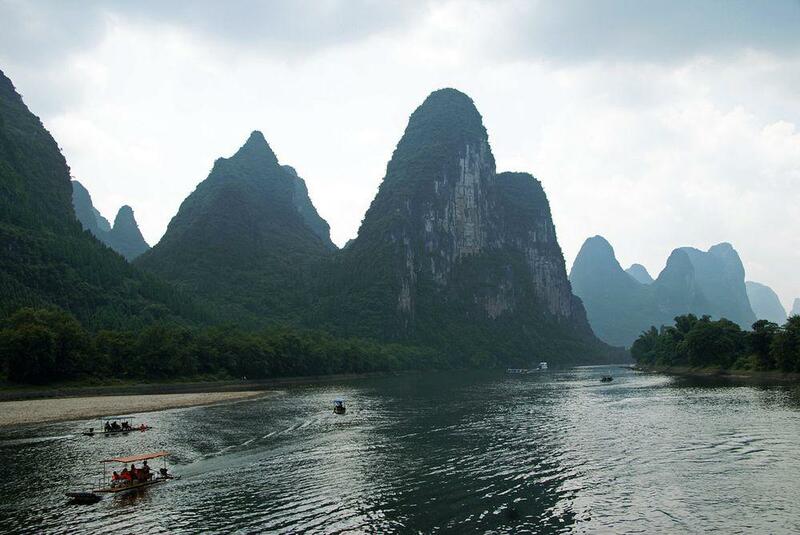 Beautiful karst landscape along the Li River, consists of numerous steep, conical limestone pinnacles. Sights of this landscape represent one of the most famous sights of China. Hạ Long Bay – Vietnam, Northeast, Quảng Ninh province. Site of unusual beauty – sea bay with approximately 2,000 tower-like islands formed by karst processes. Tallest islands are 100 m tall. Area contains many endemic species of plants and animals. Some islands have impressive caves (such as Hang Đầu Gỗ Cave). Local fisherman live in exotic-looking floating villages. Hazarchishma Natural Bridge (Hazarcheshma Arch) – Afghanistan, Bamyan. Giant natural arch over the canyon. Span of arch at its base is 64.2 m.
Seven Pillars of Wisdom – Jordan, Aqaba. Impressive, unusual mountain rising from the desert. Shilin stone forest – China, Yunnan. Spectacular karst formation, which resembles giant forest of stone pinnacles. One of the most impressive karst landscapes in the world. Stone Balls Valley – Kazakhstan, Mangystau. Floor of this valley is covered with giant stone balls – concretions of minerals. Three Natural Bridges of Wulong – China, Chongqing Municipality. Giant, very impressive natural bridges – Tianlong Bridge, Qinglong Bridge (with waterfall over it) and Heilong Bridge. Their average height is 200 meters. Tiger Leaping Gorge – China, Yunnan. Canyon of Yangtze River, according to certain criteria – deepest canyon of the world. River here is 1600 – 1800 m above the sea level, flanked by 5,596 and 5,396 m tall mountains. Trango Towers – Pakistan, Gilgit Baltistan. World’s tallest cliff towers. Largest is Great Trango Tower (6,286 m) which is world’s tallest near vertical cliff – 1,340 m.
Tushuk Tash (Shipton’s Arch) – China, Xinjiang Uyghur Autonomous Region. Possibly the highest natural arch of the world and one of the most impressive ones. Height – some 360 – 370 m, width – some 65 meters. Wulingyuan sandstone pinnacles – China, Hunan. Unusual geological monument – group of some 3,100 sandstone pillars up to 800 m tall. Well known scenic place. Xian Ren Qiao – Fairy Bridge – China, Guangxi. Beautiful natural bridge of limestone with an approximate span of 121.9 m. Possibly the widest natural arch in the world. Yarlung Tsangpo Grand Canyon – Tibet, Nyingchi. Possibly the deepest canyon in the world, up to 6,009 m deep. Average depth – 2,268 m. Contains unique, nearly undisturbed ecosystem with different height zones – from subtropical to Arctic. Yonaguni Monument – Japan, Ryukyu. 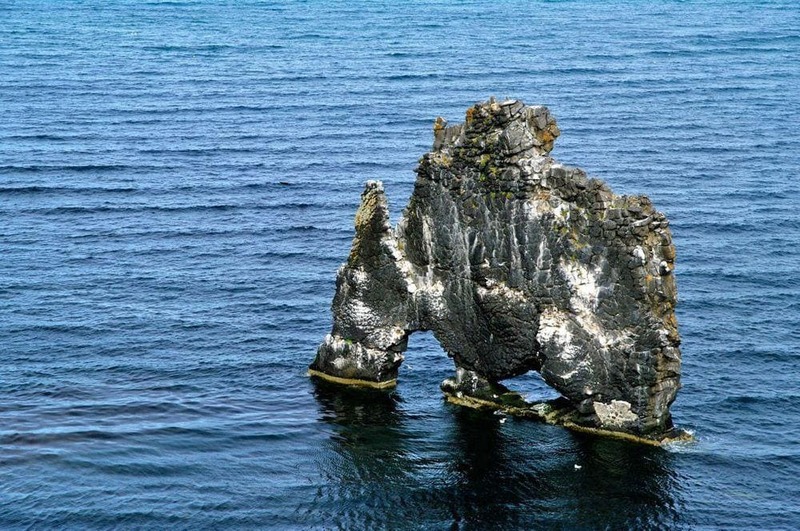 Unusual underwater rock formation which resembles terraces. There are discussions whether this is natural or man made formation, which has been made several millenia ago and now inundated due to earthquakes. Ásbyrgi – Iceland, Norðurland eystra. Unique canyon. When looking from the air, it reminds a tongue with approximately 100 m tall, vertical walls. In the middle of this tongue has remained a long, 25 m tall, narrow cliff. Ásbyrgi most likely has been formed by a glacial flooding. Benagil’s Sea Cave – Portugal, Faro. Unusual natural rock formation – a cave with natural arches and large hole in the roof. Half of the cave is under the sea – thus across the enormous cave is running a beautiful beach. Brimham Rocks – United Kingdom, England, North Yorkshire. Incredible balancing rocks with some formations up to 30 m high. Especially amazing is Idol Rock – large mass of rock balancing on incredibly small foot. 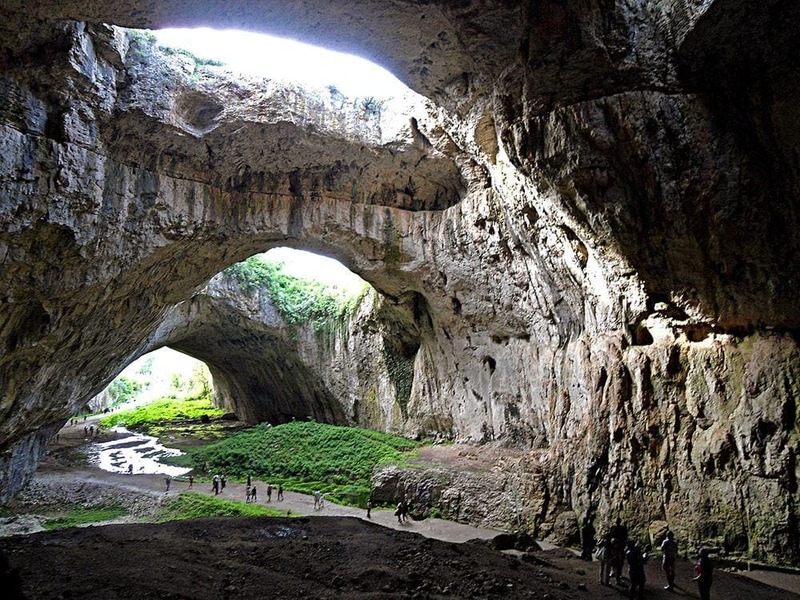 Devetashka Cave – Bulgaria, Lovech. Impressive cave with unusual entrance part: cave starts with several massive natural arches. Total length of cave is 2,442 m. In the past this cave was was used as a place of human settlement, here live also some 30,000 bats and other rare animals. Giant’s Causeway – United Kingdom, Northern Ireland, County Antrim. Area of outstanding natural beauty, with some 40,000 interlocking basalt columns. Tops of these columns form natural stepping stones leading into the sea. Hajdučka Vrata – Bosnia and Herzegovina, Herzegovina-Neretva. Amazing natural arch which resembles a standing ring. Diameter of the hole is approximately 5 m.
Hvítserkur – Iceland, Norðurland vestra. Amazing, 15 m tall cliff in the sea. This narrow cliff has two natural arches carved by the sea wave action. Peyro Clabado, Lacrouzette – France, Midi-Pyrenees, Tarn. A rounded block of granite, balancing on smaller stones. Rock weighs 780 tonnes. Pobiti Kamani – Bulgaria, Varna. Unusual rock formations which resemble columns of ancient ruined city. Formations are located in the only desert of Bulgaria, with desert vegetation and fauna. Stone columns are up to 7 – 10 m tall. Preikestolen – Norway, Rogaland. Impressive cliff rising 604 m above Lysefjorden. Top of the cliff contains flat surface, adding unusual accent to the beautiful scenery. Prohodna – Bulgaria, Lovech. Giant cave – 262 m long passage through the mountain which is world famous thanks to two openings in the ceiling – so called "Eyes of God" or "Oknata". The largest entrance in the cave has a height of 42 – 45 metres. Torghatten – Norway, Nordland. Enormous cliff monolith – mountain with well visible hole through it. This natural tunnel is 160 m long, 35 m wide and 20 m tall. Ball‘s Pyramid – Australia, near Lord Howe Island. Unusual remnant of volcano – 562 meters high and just 200 meters wide cliff rising directly from the sea. Tallest volcanic stack in the world. Up to recent time this was the only place in the world where the up to 15 cm long Lord Howe Island stick insect (Dryococelus australis Montrouzier) was living. 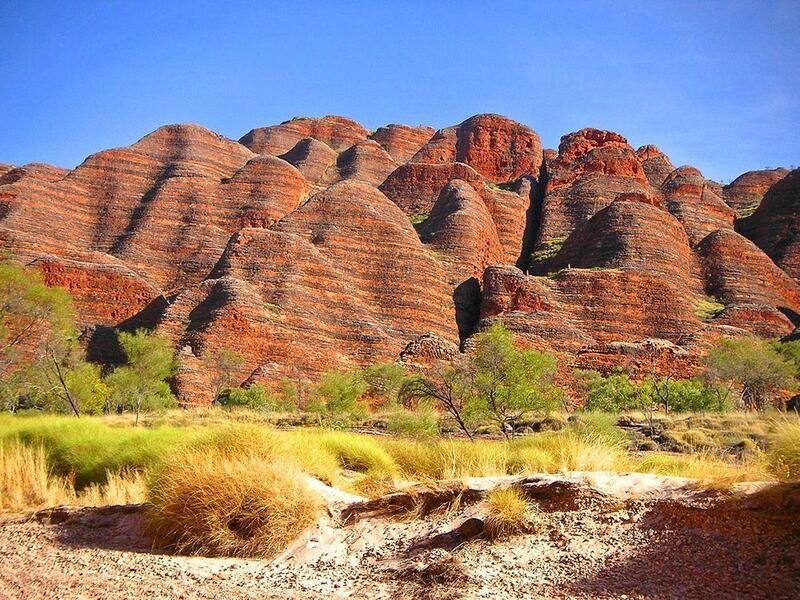 Bungle Bungle Range – Australia, Western Australia, Purnululu National Park. Incomparable landscape created by highly unusual rock formations. Landscape is marked by up to 250 meters high sandstone pillars and beehive structures of contrasting light orange and dark colors. Deep gorges, labyrinths. Important site for investigation of sandstone karst processes. Eaglehawk Neck tesselated pavement – Australia, Tasmania. Extreme, visually impressive example of tesselated pavement which looks like an exact pavement of large bricks. Moeraki boulders – New Zealand, Otago. Large, spherical boulders in the beach. Diameter of these spheres reaches 2.2 m. There are similar spheres elsewhere in the world (also Koutu Point Boulders in Northland) but these are not that impressive and that exactly spherical. 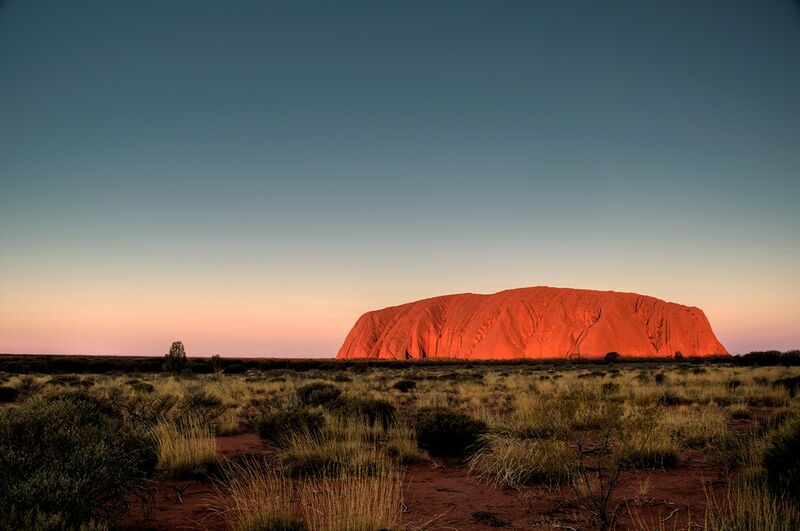 Uluru (Ayers Rock) – Australia, Northern Territory. One of Australian symbols, enormous and visually very impressive sandstone inselberg, 348 meters high and 9.4 km in circumference. Sacred place to local Aborigenes, contains many springs, waterholes, caves and rock art sites. Endemic plants. Wave Rock – Australia, Western Australia. Highly unusual cliff formation which resembles enormous petrified wave. Several more such formations in vicinity. Bimini Road – Bahamas, Bimini. Unusual natural monument – some 0.8 km long geological formation which resembles ancient man-made linear structure, located in 5.5 m depth. For a while it was considered to be a unique megalithic structure. There are several more similar sites in the Bahamas – f.e. Andros "Temple". Buckskin Gulch – United States, Utah. Narrow slot canyon, longest and deepest slot canyon in United States. Length – 21 km. Sudden rainstorm can bring 30 m high wave through the canyon. Devil’s Tower – United States, Wyoming. Igneous intrusion – a steep, unusual rock rising 386 m above the surroundings. Grand Canyon – United States, Arizona, Coconino and Mohave Counties. Possibly the most impressive canyon in the world. This 446 km long canyon is up to 1,800 m deep, with rugged, nearly vertical walls. Half Dome – United States, California. Granite dome rising 1,444 m tall above the surroundings. Ikaite tufa columns in Ikka Fjord – Greenland, Sermersooq. Almost unique phenomenon – submarine tufa columns created by cold seeps from submarine springs. Columns are formed of ikaite – unstable mineral which disintegrates in temperatures above 6 – 7 ° C. In total here are more than 700 such columns up to 18 m tall. Landscape Arch – United States, Utah. The fifth widest natural arch in the world, 88 m wide. Mount Thor (Qaisualuk) – Canada, Nunavut, Baffin Island. Granite cliffs with the possible highest vertical drop on Earth – 1250 meters high, average angle 105 degrees. Rainbow Bridge – United States, Utah. Very impressive natural arch, 71 m wide. 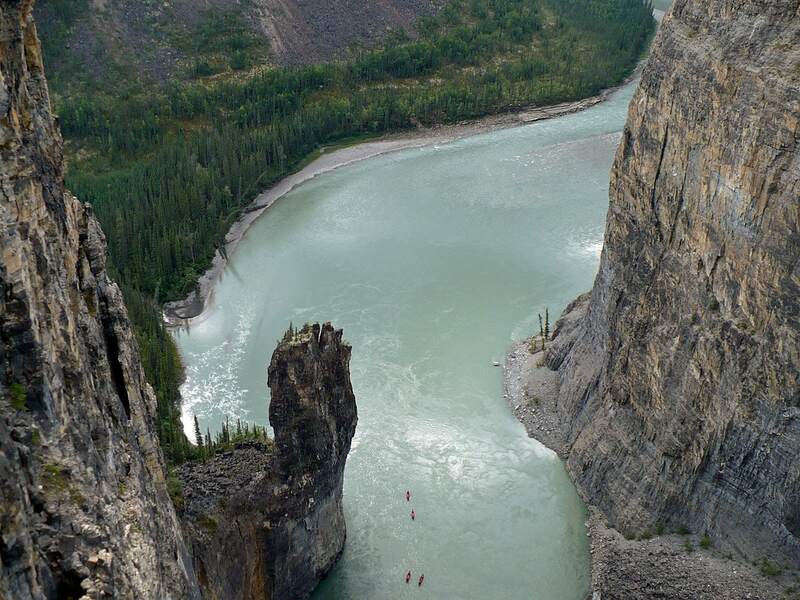 South Nahanni Canyons – Canada, Northwest Territories. Extremely impressive canyons named consequently – First, Second, Third and Fourth Canyon. Haunted place with true stories about the mysterious deaths of gold prospectors. 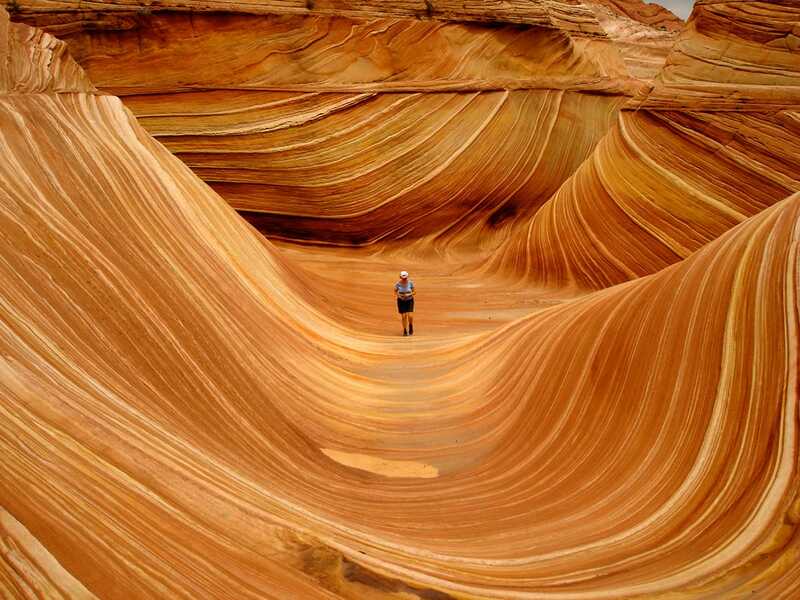 The Wave – United States, Arizona, Coconino County. Unusual sandstone formation with colorful, undulating forms. Yosemite Valley – United States, California. Up to 914 m deep, glacier carved cleft in granite rocks. Impressive landscape. Árbol de Piedra – Bolivia, Potosí. Amazing cliff formation – a mushroom / tree formed rock in the desert, standing on a thin "foot". Autana – Venezuela, Amazonas. Spectacular tepui with up to 1400 meters high walls, with a cave running from one side to the another. Itaimbezinho Canyon – Brazil, Rio Grande do Sul. Up to 720 m deep and 6 km long canyon with unbelievable, very impressive sights. Additional charm is added by exotic, tall araucarias. 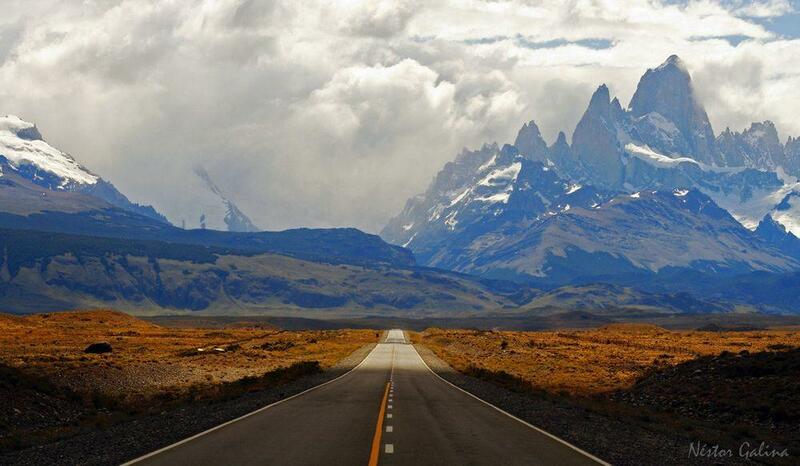 Monte Fitz Roy (Cerro Chaltén) – Argentina, Santa Cruz and Chile, Magallanes. One of the most challenging mountains in the world for climbing. The height of granite cliff face is 1,200 m.
Puente del Inca – Argentina, Mendoza. One of natural wonders in Argentina – a natural arch over Vacas River with hot springs and large travertine formations next to it. The natural bridge is 48 m long, 28 m wide and 8 m thick, the river flows 27 m below it. Below it are many stalactites. Torres del Paine – Chile, Magallanes. Three knife-formed cliffs rising with vertical walls more than 1,000 – 1,400 m high and offering one of the most impressive sights in Patagonian Andes. This type of landmarks includes most unusual and interesting rock formations of the world. It may sound simple but it isn’t: this group of monuments tends to grow and grow without end, encompassing diverse seemingly unrelated things. Thus – very tall cliff is rock formation, natural arch – as well. But – in a way cave and waterfall also is rock formation – without solid rock these landmarks would not exist. Karst landscapes – outstanding relief forms which have formed by the dissolution of limestone, dolostone, gypsum. Natural arches – cliff formations with openings below them. Nature sometimes loves to play and these arches or bridges can get seemingly improbable shapes! Rock spires – natural, tall and often even very thin spires of rocks. This classification does not include all kinds of rock formations – sometimes a landmark is too unusual and in its own “category”. Such landmarks are, for example, Eaglehawk Neck tesselated pavement in Tasmania or Richat Structure in Mauritania. Highest vertical drop on Earth could be located on Mount Thor (Canada, Nunavut, Baffin Island). This cliff has even negative drop (105 degrees) and if something falls from it, it falls 1,250 m. There might be even taller drops in Baffin Island. World’s tallest near vertical cliff (you see – there is already indeterminate expression!) is Great Trango Tower in Pakistan, Gilgit Baltistan. This cliff is 1,340 m tall. World’s deepest canyon could be Yarlung Tsangpo Grand Canyon in Tibet, Nyingchi. It is up to 6,009 m deep, although medium depth is 2,268 m.
World’s tallest volcanic stack is Ball’s Pyramid, Australia. It rises 562 m tall from the sea and is just 200 m wide. World’s highest natural arch could be Tushuk Tash (Shipton’s Arch) in China, Xinjiang Uyghur Autonomous Region. Its opening is just incredible: 360 – 370 m high! World’s widest natural arch could be Xian Ren Qiao – Fairy Bridge in China, Guangxi. It is approximately 122 m wide. World’s largest freestanding boulder could be Giant Rock in United States, California. This rounded boulder covers an area of 540 square meters. The largest balanced rock in the world could be Miracle Rock in United States, Colorado. This is some 12,000 tons heavy behemoth balancing on impossibly small foot. Looks at the earth’s crust, sedimentary strata, erosion, geologic mapping, fossil beds, folds and faults, volcanoes, and glaciers. Celebrated landscape photographer David Muench turns his keen photographic eye to the mystery of the sculpted earth in WINDSTONE: NATURAL ARCHES, BRIDGES, AND OTHER OPENINGS. These spectacular photographs of natural arches, land bridges, windows, sea stacks, caves, and sea arches represent a master photographer at the top of his game.